First of all, I want to thank everyone who contributed to this blog post. You asked and I am giving it to you! Now, as you know, I am not a doctor. So this post is purely based off of my personal experiences and the experiences of my life coaching clients. Are you living with anxiety? If so, the good news is that you are not the only one who struggles with it! I too have had to fight this battle. My anxiety was brought on by a series of life events and it lasted for about a year. During this time I felt out of control, helpless, and scared. As you can imagine, these things only make it worse. The following are a few skills that I learned to implement that really helped me manage my anxiety. To this day these techniques help keep me from going down the rabbit hole. #1 Use deep breathing! Don't underestimate the power of deep breathing. One of the first things that happens when my anxiety flares up is that my heart starts to race and I can't catch my breath. That alone makes me feel more anxious and uneasy. Deep breathing is a technique that I have recommended to many of my clients with great results. If you have ever meditated, you know that to focus on your breathing is the basic concept of meditation.. If you can focus your mental energy on your breathing, this will get you "out of your head." Even if you can do this only for a few seconds, it will be the beginning of you managing your anxiety. We do have choices when it comes to where we focus our mental energy. It takes time to develop this skill but it is possible. When you feel your mind and your body going to that unpleasant place, simply stop what you are doing, close your eyes, and focus on taking deep, long breaths. Do this for at least 30 to 60 seconds until you heart rate begins to slow down and you feel your body relaxing. It's one minute out of your life. If doing this prevents you from going down the rabbit hole of anxiety ridden thoughts, then it's worth every second. This is a great tool that can be utilized anywhere. #2 Identify what is triggering your anxiety. It may not be just one thing! As a matter of fact, it's probably multiple things. You need to identify them as this is the first step to gaining clarity. For me, the anxiety was created by a swirling storm of simultaneous thoughts, mostly negative, that really had nothing to do with one another. These were thoughts that I was allowing to come in that were completely unrelated to my present situation and quite frankly, not real. Writing these thoughts down will help you begin to sort through what your real fears and/or concerns are and which thoughts are just your mind playing the "what if, worst case scenario game." I love writing things down because it helps me prioritize and it gives me direction. Sorting through what's really happening as well as what you are afraid is going to happen, is key. Focus on the what's happening in the present moment and begin addressing those one to 2 things. #3 Reflect on your life. This was a huge part of learning to manage my anxiety. It is because of this one tool that I rarely struggle with anxiety anymore. I realized that the majority of stuff that I was imagining in my head never actually happened and probably never would. Our brains are so powerful! Think about it. Have you ever gotten a phone call in the middle of the night and before you even said "hello" you have already played out multiple scenarios regarding what the person on the other end of the line is going to say!? We are imagining worst case scenarios and they haven't even happened yet! That is TORTURE! Have you ever made yourself cry over something that you are imagining in your head? I have! We are amazing storytellers. Often these stories are fiction, but because we play them out in our heads over and over again, they somehow become a piece of our reality. Here's the challenge: REWRITE THE STORY. Just like we make up a negative, horrible, and sometimes tragic, story in our head, we have the power to make up a positive, uplifting and pleasant story. The next time your anxiety tries to hi-jack your brain, take a few deep breathes, identify what triggered your anxiety, then rewrite the story in you mind and on paper. What if it does work out? What if you do get that job? What if you succeed? What if the boss likes what you did? What if your husband isn't cheating on you? What if you can lose weight? What if your kids are doing the right thing? What if you are not going to lose your job? I want you to start playing out these thoughts! These positive messages will help you use your mental energy in a much more productive way, which means you will be more likely to make decisions from a loving place as opposed to a fearful place. Not only will you benefit, but your loved ones will too. We all have anxiety sometimes...I want to give you these tools to help you face it when it comes your way. I think you may have forgotten this. 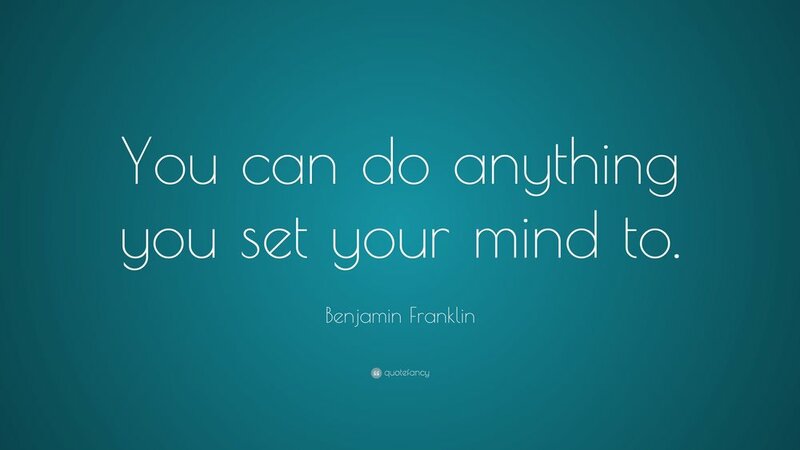 You truly can do anything that you set your mind to. Think of all the obstacles that you have encountered in your life and how you prayed for perseverance. You persevered because you leaned into your faith and would not accept defeat. Life has it's way of challenging us ... especially with the things we hold near and dear. It's these test that make you stronger and remind you of the real passion you hold inside. As you read this, think of all of your accomplishments and WRITE THEM DOWN so that you don't forget. You may need the reminder in week, month, or few days...lol. You have everything you need inside of you to accomplish our dreams and goals. Whatever is in your heart, don't abandon it. Pray for guidance and clarity and take one step at a time until you get there, but don't ever give up. I wanted to take this time to wish all of you a Happy Easter! I hope that you are still continuing on your journey to more purpose, more personal power, wholeness, and life. When you took that first step to join our wonderful group, I believe that you set some life changing things in motion. Remember, that first step is always the hardest and we learned a lot together in that group! Our relationship with food is one of the most important relationships that we will ever have. Why? Because we need food to live! Food is a wonderful thing, as long as we don't abuse it by having too much or too little. Food can make us feel great or it can make us feel horrible. The goal is to use food to make us happier, healthier, and stronger. As a health coach, I teach my clients that health is a total body affair: mind, body, and spirit. You can not have good health, and more importantly happiness, without focusing on all of YOU! Most of the time we focus on what’s going on around us instead of what’s going on inside of us. It’s true! Whether, we are trying to lose weight, save money, or find a new job. Let’s face it, we all want to wave a magic wand and be at our goal weight for the rest of our lives and never have to think about it again. Right?! PIE IN THE SKY! The reality is that you did not gain weight with the wave of that magic wand! I guarantee that your weight gain was directly connected to the events that have taken place in your life whether it be going to college, getting married, having a baby, getting that new promotion that you worked so hard for, divorce, health crisis, and/or the loss of someone or something. This is why keeping a journal is CRUCIAL TO YOUR SUCCESS!